"Reeeoowwwrrrrr! Bat-Maaaaan! Laser gun...peow, peow, peow!" 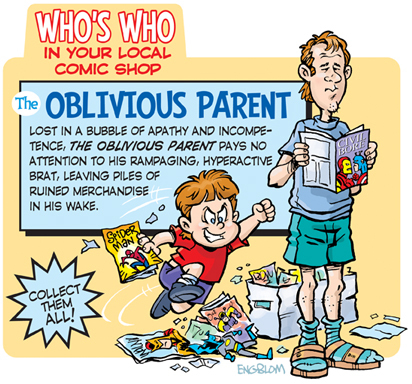 Ahh, nothing like the ear-splitting chaos of the Oblivious Parent's progeny to enhance your weekly comic shop visit. Whether pawing new comics with chocolate-caked fingers, flinging action figures, or running at top speed, these tiny terrors thrive upon the non-supervision of their clueless, auto-pilot parents.